Course Type: Practical - These courses are run to order - please contact us for details. Cost: £660 inc (High season April - October). £625 inc (Low season November - March). Yachtmaster is the senior qualification for the charter and sail of leisure and commercial yachts of less than 24 meters. The 5 day course comprises of 4 days coaching and develops and polishes skills & techniques in crew management, on board safety, boat handling, passage making & planning, followed by 1 day allocated for the MCA EXAM. (To be arranged and paid for separately). Note; Please ensure that you have successfully completed the Yachtmaster theory course within the past 12 months so as to get the most from this practical course. 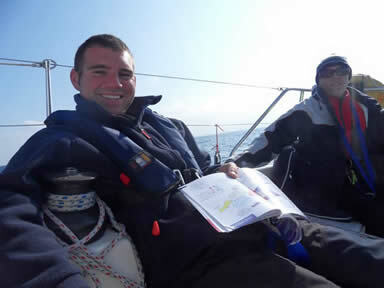 Obtaining the highest recognised qualification in yacht sailing. Extending bareboat range in time and distance. Chartering the largest yachts of up to 24m. Those honing and developing advanced skills. A mature crew leader able to utilise your experience in yacht preparation, passage planning & pilotage, crew management and yacht husbandry. Skilled in tidal and weather tactics for extended cruising. Competent to skipper a yacht on any passage of no more than 150 miles from harbour. Experienced in night sailing, watch keeping and shipping lanes. An accomplished cruising yacht skipper. You will be a Yachtmaster and confident to undertake extensive passages to new locations.